Scott Lang addresses the Education Committee members. This issue is the most important issue I believe that the legislature is going to take up this year: the unintended consequences of education reform. First, this is a public policy decision that has to be made. This is not a decision that should be referred back to DESE. After 13 years of MCAS as a requirement to graduate, we need to really start to look through the weeds and see how this is affecting the state. I believe it fuels the drop-out rate, not only for the kids who believe they won’t pass the MCAS test – and they may actually be getting that impression by fourth grade – but also it fuels the drop-out rate for kids who feel that school now is just teaching-to-the-test. All of us had testing. All of us had assessment. We all sat for the Iowa test, or whatever it might be. The problem here now is, by tying it into the graduation requirement, and also, indexing it into whether a teacher is doing a good job or a bad job, you wind up in a situation where we have gutted teaching the entire child, teaching kids good citizenship, teaching kids history, teaching kids health, teaching kids phys ed, art, and music – all of these were gutted. They were gutted one by one in New Bedford because we were striving to meet guidelines and goals. Standardized tests? I’ve never met a standardized kid. For the first six years, they didn’t know what to call these young people. Now they call them “non-graduating completers.” A non-graduating completer in society is the same as a drop-out. The commissioner said we could forfeit millions of dollars, maybe hundreds of millions of dollars in federal aid. Our unfunded liability as a result of having non-graduating completers because of the MCAS system, totals, last year, $264 million for the support that we will have to contribute for these young people and their families for their lifetimes. $360,000 times 763. I don’t know that I passed the math MCAS but I believe that’s about $264 million. 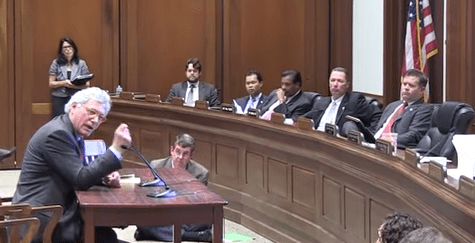 The cost of the unfunded liability – I think all of us in this room understand unfunded liabilities – since the MCAS for non-graduating completers and drop-outs is somewhere around $10 billion. So if we’re going to forfeit a few dollars in federal funds – by the way, we’re the number one state in the country. We’re in the top 10 in the world. Two thirds of our schools are “under-performing.” That makes no sense to me. And now we’re going to forfeit federal money? For being the leader in education, because we’re either not going to dance the PARCC, or have a system that very few states actually require: the standardized test as a graduating requirement? I go to New Bedford High. By the way, my two boys did that: did a great job, graduated from college, both are professionals, fantastic, and they didn’t have the MCAS because we trusted the teachers back then to determine whether or not they earned their public school diploma. But what it comes down to is this: I go to New Bedford High now and Jane Doe goes to New Bedford High. I take the MCAS. I pass the MCAS. Jane Doe takes the MCAS and does not pass. She may be higher than me in rank in my class. She passed all her courses as I have. Perhaps she’s learning English as a second language, or perhaps she’s involved in special ed. She did everything I did, but I filled out a couple more bubbles. I get a degree. She doesn’t. There’s no remediation in the state system now. The junior colleges don’t do remediation. If she wants to get MCAS remediation, she’s going to have to pay for it. We’re going to pay for Jane Doe for the rest of her life. That is not good for us. That is a disaster. We’re going to lose our democracy. And the reason we’re going to lose it because right now, if you go to a private school, you don’t take the MCAS. You talk about the McDuffy case. How are we providing the best opportunity for our kids when the private school kids don’t have their teachers vetted, the public school kids do, and the parochial school kids don’t, and they all get the same diploma? You don’t get a diploma. But we will send you a check each month. Because you’re not going to get into society. And if you do, we’re going to subsidize you. There aren’t enough people working day in and day out to subsidize the people we’re keeping out. This is a failed prescription. The status quo on this is absolutely dead. Those are the citizens we want? I believe in assessment. I believe in accountability. I don’t believe, though, in setting up a prescription for failure. And I think the legislature is the place to do this now. The numbers are overwhelming. Between dropouts and non-graduating completers, the unfunded liability that we’re not carrying on the books is $10 billion. I’ve seen an awful lot of kids much smarter than any of us in this room, who have been locked out of society because of the tests. So true.what a champion for the little guy.